This isn't really my usual style, but the combination of one of the most spectacular architectural landmarks in Britain, a trainload of logs, an interesting sky, and a wide lens, were too much to resist. This is an earlier picture of the same viaduct. The East Lancashire Railway is a heritage railway running trains between Heywood and Rawtenstall in Lancashire. They have events all year round, but it has become a tradition of ours over the past few years to spend a day at one of the steam galas held in January. As a family the chance to spend some time together travelling up and down the line, looking at the countryside and enjoying lunch in a trackside pub, has a lot of appeal. 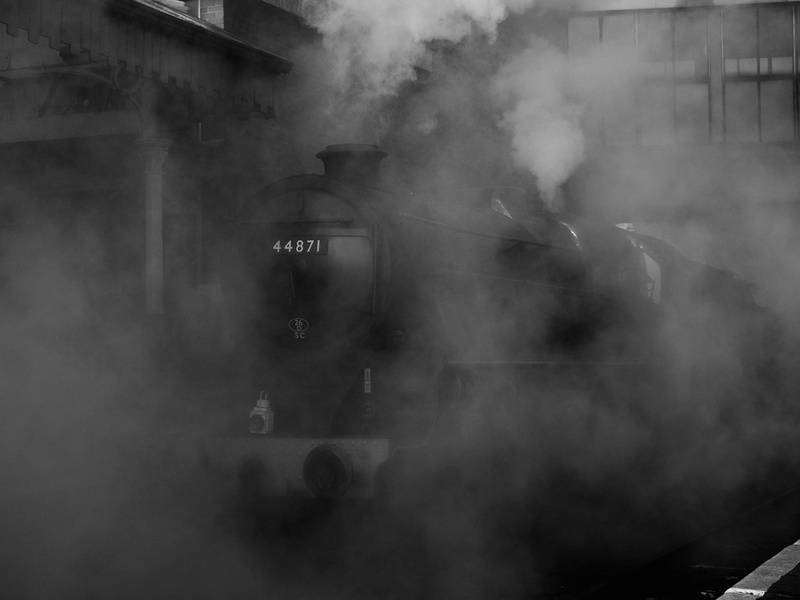 But it is also a great chance to take photographs of these charismatic machines as they belch smoke and steam. On these outings I enjoy especially taking pictures that cut out as much as possible of the modern world, allowing the steam to smudge the image, or taking pictures through steamed up windows, or from moving trains. Steam railways like this are museums where the exhibits move around, but there are ghosts here too and I like to try to capture that feeling if I can. There are moments when it isn't always clear that we are in the twenty-first century at all.